Our society has become obsessed with the overnight sensation. We are entranced by the performer who sings with perfection, the star athlete who makes all the right moves at the right time, and the businessman who comes out of nowhere to build a massively successful business. We focus on the outcome. We attribute them to being gifted with special talents. It makes one pause. Are successful people simply lucky, or is there a path or formula that anyone can follow in order to succeed? While luck may play a role in one’s success, I’ve come to believe that there is more to it. For example, in order to take advantage of luck, one has to be ready and prepared when the opportunity presents itself. In many cases, a person creates their own luck. So what is it a person does to reach such high levels of achievement, success and happiness? The Slight Edge: Turning Simple Disciplines Into Massive Success & Happiness by Jeff Olson sets out to provide answers to this question. What Jeff points out is that it isn’t one choice or decision we make that leads to success or happiness. It’s a series of choices. These simple choices that we make every day, when looked at in isolation, don’t seem like much. They may involve getting up early to work out at the gym, deciding to eat a piece of fruit over a cookie, or reading a book instead of watching television. The additive effect of these choices over time is what creates opportunity and leads to success. As is so often the case, these choices that we must make to succeed are not easy ones. They require discipline and self control. The other key item covered in the book is the mindset that it takes to stay on the right path. It requires that we take a positive approach to life. It requires that we are continually grateful and counting our blessings. It requires that we make a choice to succeed each and every day. Jeff refers to this process as “The Slight Edge.” As he points out numerous times, this slight edge can either work for us, or it can work against us. When we are making the right choices, we stay on the path to success. When we are making poor choices in life, these compound to work against us and lead us on a path to failure. Fortunately, if we find ourselves on the path to failure, it only takes us making a choice to get back on the path to success. I can’t recommend The Slight Edge enough. While many of Jeff’s observations and recommendations seem like common sense, it’s important that we are aware of the cause of our success and happiness. The causes are directly related to the choices we make and how we act on a daily basis. For me, when I look back at times when I have achieved high levels of success, I can directly attribute them to the methods in Olson’s book. The unfortunate thing is that I wasn’t aware that I was doing them at the time. Therefore, when I started to slip or fail, I didn’t realize it was because I had quit making the choices and doing the things that helped me achieve success. Being aware now will help me know how to adjust and correct my behavior. I’ve already started putting many of Jeff’s recommendations into practice and have noticed differences in my day-to-day outlook on life. Needless to say, The Slight Edge is a must read. I would be shocked if it didn’t have a significant impact on your outlook on life after reading it. I’d also highly recommend checking out this post titled Success – luck or choice before (or after) reading the book. 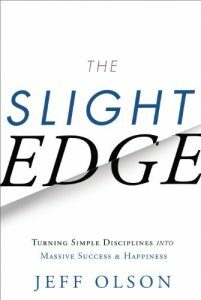 This post, while not related to The Slight Edge, neatly summarizes the concepts presented in it. In addition, reading The Slight Edge has inspired me to reread an old favorite, Psycho-Cybernetics by Maxwell Maltz. There are a lot of overlapping concepts between the two books, with Psycho-Cybernetics getting a little deeper into the science of how and why the concepts in The Slight Edge work. It’s another book that is well worth the time spent. I’d be remiss if I didn’t thank a good friend, Erik Zimmerman, for recommending this book and would like to wrap up this post with one last anecdote. Our life may seem like a journey full of random, unconnected events. The longer I live, the less I believe this to be true. I really believe that events and situations that occur in our lives are connected and are a direct cause of the choices that we make every day, whether we are consciously aware of them or not. For example, it wasn’t by luck or chance that I happened to meet Erik. That specific outcome was the culmination of a series of decisions and choices over months, if not years, that I made that led me to securing a meeting with him at his office in Cincinnati. We had an engaging discussion where we shared book ideas, and he insisted that I read The Slight Edge. My friendship with Erik has enabled me to meet other amazing people and presented me with additional opportunities, both personally and professionally. It’s difficult for me to attribute these events to chance or luck because there have been so many. If anything, it was the choices that I made when the opportunities were presented that made the difference between success and failure. I could attribute what happened above to randomness, but it isn’t. It’s The Slight Edge at work. I encourage you to try it. Trust me, you really have nothing to lose and a lot to gain. This entry was posted in Book Reviews, Must Reads and tagged Books, Must Reads on January 14, 2017 by Gregg Borodaty.